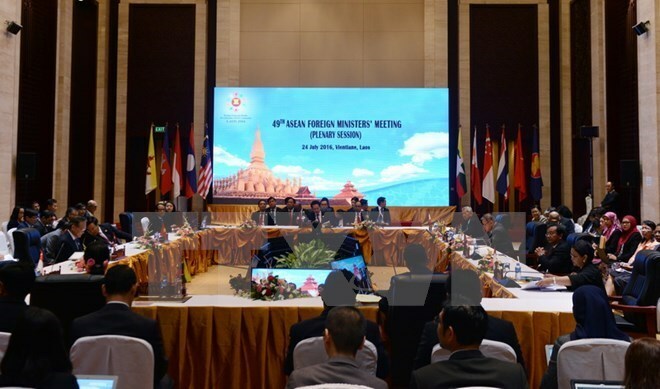 Hanoi (VNA) – ASEAN foreign ministers had separate meetings with the bloc's partners on July 25 as part of the 49th ASEAN Foreign Ministers’ Meeting (AMM 49) in Vientiane, Laos. At the meeting between ASEAN with China, participants welcomed progresses in implementing the Plan of Action to Implement the Joint Declaration on ASEAN-China Strategic Partnership for Peace and Prosperity in 2016-2020. The two sides are expected to soon complete preparations for the bilateral summit to mark the 25th anniversary of their dialogue relations, which will take place in Vientiane this September. The ministers acknowledged efforts towards the goal of 1 trillion USD in two-way trade between ASEAN and China by 2020. China is currently the biggest trade partner of ASEAN while ASEAN is the third largest trade partner of China. The bilateral trade topped 472.16 billion USD in 2015. The ASEAN-Japan Foreign Ministers’ Meeting recognised strides in implementing the Vision Statement on ASEAN-Japan Friendship and Cooperation. The ministers hailed Japan’s support in building the ASEAN Community, including its commitments to narrowing the development gaps between ASEAN member states, promoting growth quality in the Greater Mekong Sub-region, and implementing Tokyo Strategy 2015. They also highly valued Japan’s assistance in building an integrated information and communication technology system to strengthen the full operation of ASEAN the Coordinating Centre for Humanitarian Assistance on disaster management. The foreign ministers pledged to step up cooperation in preventing terrorism, cross-border crime, cyber crime, human trafficking, and extreme violence. At the meeting between foreign ministers from ASEAN and the Republic of Korea (RoK), the two sides agreed to enhance collaboration across the fields, including the ASEAN-RoK Plan of Action to Implement the Joint Declaration on Strategic Partnership for Peace and Prosperity in 2016-2020. Participants welcomed the signing of the third Protocol to amend the ASEAN-RoK Free Trade Agreement in an effort to reach 200 billion USD in two-way trade by 2020. They also recognised progresses in cultural and people-to-people exchanges, including the upcoming establishment of ASEAN Culture House in the RoK. The meeting hailed the RoK’s support in mitigating the risks of natural disasters and responding to climate change. During the ASEAN-Indian foreign ministers’ meeting, the two sides agreed to boost cooperation in economics-trade-investment and navigation, while sharing experience to deal with security challenges such as terrorism, extreme violence, and cross-border crime. The ministers welcomed India for pledging to provide one billion USD in a credit loan to speed up the implementation of the India-Myanmar-Thailand highway project, which is expected to expand to Vietnam, Laos and Cambodia. They also hailed India for increasing fund for the ASEAN-India Science & Technology Development Fund from one million USD to 5 million USD while setting up some English teaching and informatics training centres in Cambodia, Laos, Myanmar, and Vietnam. At the meeting between ASEAN and Australian foreign ministers, the two sides agreed to enhance cooperation in preventing terrorism, extreme violence, and human trafficking as well as implement effectively the ASEAN-Australia-New Zealand Free Trade Agreement. In another meeting between ASEAN and US foreign ministers, the two sides agreed to boost cooperation in economics-trade-investment in addition to preventing terrorism, extreme violence, cyber crime, human and wildlife trafficking, and ensuring navigation security. They also agreed to increase collaboration in disasters management, humanitarian aids, fisheries, marine preservation, climate change, education, environment, health, and cultural exchanges. During their meeting, foreign ministers from the ASEAN and the European Union pledged to build a roadmap towards the ASEAN-EU strategic partnership, and agreed to step up cooperation in combating cross-border crimes, especially terrorists, human trafficking and cyber crimes. They will also increase collaboration in maritime issues and the regular organisation of the ASEAN-EU High Level Dialogue on Maritime Security Cooperation. The ministers weighed the feasibility of the ASEAN-EU Free Trade Agreement and expressed their wish to soon kick-start negotiations of a comprehensive air transport agreement between the two sides. The 21st ASEAN-EU Foreign Ministers’ Meeting is scheduled to be held in Bangkok from October 13-14, 2016. Also on July 25, ASEAN and Russian foreign ministers consented to effectively implement the plan of action during the 2016-2020 period in an effort to realise potential cooperation in areas of shared concern. They stressed the significance of enhancing the affiliation in the fight against terrorism within the framework of the ASEAN-Russia Joint Declaration for Cooperation to Combat International Terrorism issued in 2004 and the ASEAN Regional Forum (ARF) Work Plan for Counter - Terrorism for 2015-2017. They held that economic links have been strengthened thanks to the ASEAN - Russia Trade and Investment Cooperation Roadmap, along with work plans spanning science, technology, agriculture, energy and food security. The ASEAN-New Zealand foreign ministers’ meeting applauded New Zealand’s support in education, business, natural disaster risk management and agriculture.